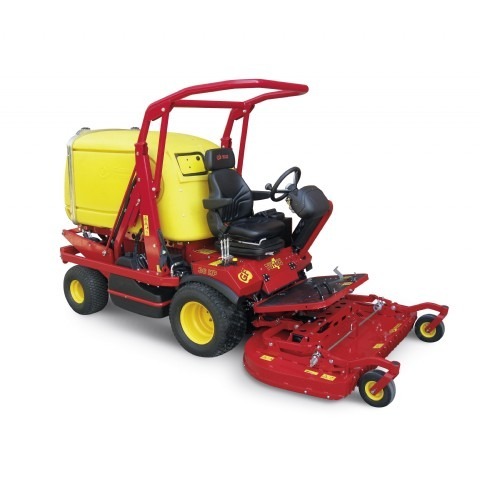 The Gianni Ferrari Turbo 1 and Turbo 1W are compact and powerful machines. The new Turbo 1 is extremely efficient on flat ground or on areas with slight slopes. 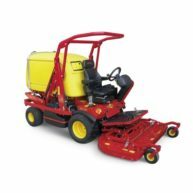 A powerful 3 cylinders diesel engine and a large blower allow very high cutting speed and a very good cutting quality even with high and wet grass. A 900 litre grass collector, together with a high dump elevator (dumping at 2.1 mt) will make your job extremely productive with a top speed of 18 km/h. Very compact, can easily work with obstacles and narrow paths. The Turbo 1W is provided with 4 wheel drive for a perfect traction on hard slopes. Turbo 1 and 2 are provided with hydrostatic transmission with variable pump and hydro motor controled by lever. Front axle with differential lock. The double transmission is provided by 2 orbital hydro motors connected to the rear wheels. The system is provided with a partial disengagement device of the front axle to avoid scuffing and to increase the steering angle of the machine.